The drills and moves are not explained well in the videos. No instruction on how to do moves properly. You Want a Jumping Program That Delivers! Whether it's Iverson's crossover or Harden's step back, seeing a player with a move that allows them to score at will is downright impressive. For those of us who are constantly trying to get a leg up on our competition we are always looking to put new tools in our hoops arsenal. The more tools we can use in a game the more effective we will be against all different types of defenders. 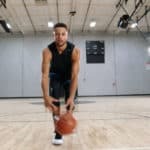 One of the best ways to build your basketball skillset is to find basketball instructional videos on Youtube and practice the moves taught during practice sessions. 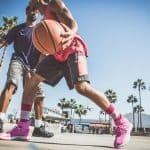 There are a great many popular basketball instructional channels you can follow that will give you an inside scoop on how to build a catalog of moves. While you can find these videos for free, putting together an actual program that organizes these skills into a comprehensive basketball program is difficult. Not having such a program can make knowing what to work on and when a struggle. That's where programs like Can't Be Guarded by ILoveBasketball comes in to play. The goal of Can't Be Guarded is to give you all the offensive basketball skills you'll need in a format that allows you to practice on them with confidence. Here I discuss the people behind Can't Be Guarded, the exercises, and the layout of the I Can't Be Guarded program. The face and mind behind the Can't Be Guarded program is Coach Rocky Ullah, or Coach Rock. 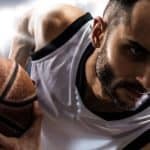 A well known Youtube personality, Coach Rock's ILoveBasketballTV Youtube channel has 1.6 million subscribers at the time of writing this review. 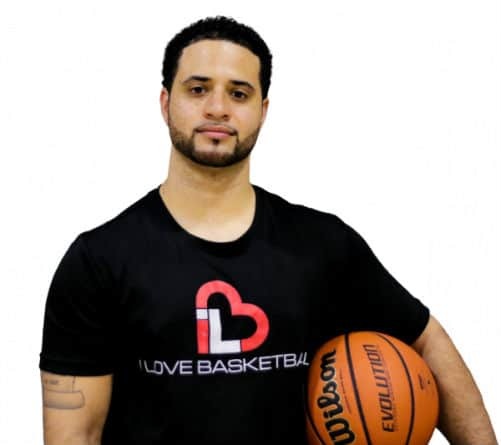 This makes him one of the most popular basketball instructors in all of Youtube. That should provide you with some understanding of the value this guy provides to his fans. Whether you want to learn the step back jumper or do a specific dribbling move, odds are there is a video from Coach Rock showing you how it's done. From this popular channel, Coach Rock has now come out with several paid basketball training programs including GameTime Handles, Guard Focused, Plyovertical, and of course Can't Be Guarded. My opinion when it comes to purchasing basketball training programs is less is more. I want the purchasing experience to be simple, without being bombarded with add-on offers and repeated attempts to get personal information, like an email address. Thankfully, it seems that Coach Rock has my same philosophy when it comes to the Can't Be Guarded buying process. Yes, you'll have to enter your name, email, and payment info, but you won't get a bunch of extra steps in the process. The only add-on was for the ILB Insider newsletter. This was on the same page as the rest of the payment info so it didn't take up more time with unnecessary page loads. Overall, I'm happy with the Can't Be Guarded Purchasing experience. Once you've purchased Can't Be Guarded, you'll be taken to the main menu of the program. From there you'll want to select "Getting Started" from the navigation menu. The getting started page will show you an introduction video and houses all the downloads you need for the program. Each drill has an accompanying video of Coach Rocky showing you how to do the drill. 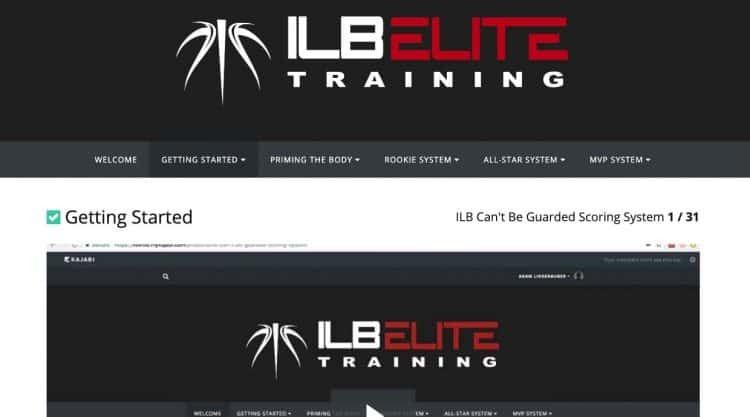 In the getting started page downloads there is the daily workouts PDF, which has the six workout routines included in Can't Be Guarded and the specific drills to do for each routine. There is also a calendar that shows you which routine to do on each day. The entire program lasts 84 days. Of course you could start the program over once completed, or mix and match the drills as you wish. Most of the drills for Can't Be Guarded can be done at your driveway hoop if you have enough space. I'd still recommend doing these workouts in an indoor gym or playground court so you can do the three-point drills. The drills and routines in Can't Be Guarded build upon each other. So as you get better, the drills become harder and more complex. Several of these drills will be familiar to you if you've ever looked up basketball drills on Youtube. 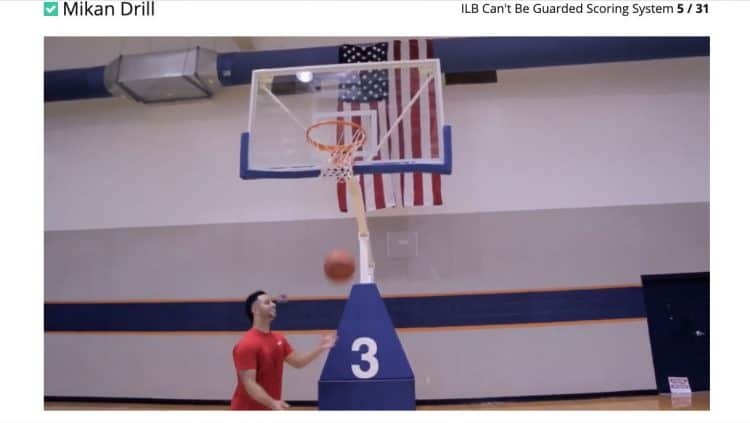 Because Can't Be Guarded is all about mastering different ways to score the basketball, you are definitely going to need a basketball hoop and court to work on these drills. This is something almost everyone has access to whether at the local YMCA, playground, or driveway. All of these drills can be done on your own without a partner. This means you can get out there and put the time in no matter the day or time. The vast majority of the drills are off the dribble moves so this program will also be good for your ball handling skills. As mentioned above, you'll want to go through the "Getting Started" section of Can't Be Guarded so that you understand the layout and structure of the program before digging into the actual drills. 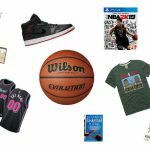 There are some additional bonus resources included in your purchase of Can't Be Guarded. These are focused mainly on the mental side of the game and include Pre-Game Mentality, Getting Over A Bad Game, and Killer Mentality. While not the core of the program, I believe these topics are critical to success in basketball and should be taken with utmost seriousness. Once you get into the actual drills and structure of the program you'll see Can't Be Guarded is divided into three levels: Rookie, All-Star, and MVP. Each level has their own set of drills that you will do as part of the program. The drills from these levels are organized into the six workout routines that you will rotate through as part of the Can't Be Guarded Calendar. The first level of the Can't Be Guarded Program, the Rookie System helps you build the foundation for the more complex drills that you will do in the All-Star and MVP Systems. Exercises from the Rookie System are included in the workouts A and B. Some drills from this system include the Mikan Drill and In Your Sleep Pull-ups. As with the other two levels, the Rookie System is 28 days long. The middle portion of the program is the All-Star System. Much of the All-Star System drills build upon the Rookie System drills allowing you to seamlessly add to your basketball skill set. For example, in the All-Star System version of the Mikan Drill, you'll be using two basketballs instead of one. This makes the drill a whole lot tougher and physically taxing. The last level of the Can't Be Guarded program is the MVP System. This section builds on the two previous levels to take your game to the advanced level. The drills and moves at this level are difficult and will require hundreds of hours of practice to truly master. When it comes to ball handling you'll be doing more combo crossover moves that will depend on quick hands and proper footwork to execute. Most of the drills at this level incorporate multiple offensive skills rather than working on one skill in isolation. For example, in Killer Pull-ups you'll be doing a combo dribble move into a jump shot, thus working both advanced ball handling and perimeter shooting. To get Can't Be Guarded, plan to pay $97 for the program. This seems a bit on the high side to me, but not crazy. As far as value goes, I'd put this price in the average range. Can't Be Guarded's biggest strength is the overall structure of the program. The structure is simple to understand and tells you clearly what drills you should do each day of the program. Having each level last 28 days makes the program even easier to follow. There are six workouts that list which drills to do every day. There are two workouts for each level that alternate on workout days. While some of the drills are pretty common, the majority of drills in the Can't Be Guarded program are awesome and will certainly help you become a better player. This is especially true if you struggle to beat defenders off the dribble and often lose the basketball when dribbling. Through the drills in this program these weaknesses will be shored up. 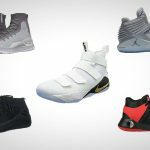 You'll also develop more tools to help you finish around the rim. If you are prone to missing layups (like me) then working the layup drills will help you make more layups no matter the angle. Being able to make layups, mid-range shots, and 3-pointers makes you very difficult to guard as defenders won't be able to cheat to a weakness. If you can do all three of these well, you have no weakness. In Can't Be Guarded there are drills that focus on all three of these shot ranges, which helps you develop into a well-rounded hooper. This weakness in the program really surprised me and hopefully it is something the ILB team will improve. While the instructional videos show a good example of how to do each move, they don't provide any actual instruction. You won't get lessons on how to do moves properly or lessons on hand position or footwork. These are all crucial to doing offensive moves effectively. If you can't do the move properly you won't beat a defender with it because it will be slow and weak. I'd like to see the videos for each move be longer (3-5 minutes) with breakdowns on what makes the move effective, and the key things to think about while executing each move so that it is done correctly. Surprisingly, the video editing is a weak point for Can't Be Guarded. On several of the instructional videos the video cuts off abruptly. Given that these are not complex video edits, I'd like to see them redo these again with the format I mentioned in the first con; longer videos with actual instructional teaching. Listen, I'd love to tell you that if you go through this program I guarantee you'll be scoring 20+ points per game. The truth is I can't make that promise because it is not likely to be true. There can only be one leading scorer on a team. There are several factors that are relevant when it comes to how much you'll improve by using this program. The first is your current and future potential skill level. Let's face it, some of us are just naturally faster and stronger than others. That doesn't mean if you are slower you can't be a good basketball player, but it does mean you'll have to focus more on being as skilled as possible compared to more athletically inclined players. In regard to this program, developing your speed will help you get the most out of the moves used in Can't Be Guarded. Obviously, the faster and better you can do the moves the more effective you will be. Another factor is how hard you train using the program. When you do the workouts in Can't Be Guarded there won't be anyone to push you to go hard, but it is critical that you do if you want to get the most out of the program. Taking it easy on these drills will not translate to in-game results, even if you are doing them correctly. Be ready to push yourself. Bottom line: if you aren't losing the basketball during the ball handling portions of these drills from time to time then you're not going hard enough. While I can't be sure how much you'll improve I've developed a small table estimating points per game gains depending on player type. Based on the table below you can see that I feel that this program will be best for beginning players who are naturally athletic. Developing the skills in the Can't Be Guarded program will make a player of this type extremely difficult to handle and allow them to be a threat, especially from mid-range and inside. Average athletes who have advanced skills (like myself) will benefit the least. Players like this can do these moves, but it is a matter quickness and speed that keeps them from being effective. For players in this category I'd spend more time training functional strength and quickness so that you more closely match your athleticism to your skill. Has been playing basketball regularly for 3 years or less. This player is quick, athletic, and can jump. Lacks discipline and skill. Poor ball handler and shooter. This player is difficult to handle as they have some skill inside and outside. Still have some work to do when it comes to ball handling and decision-making. Not the fastest, but not the slowest, this player will need to develop both physical skills and use intellect to beat more athletic opponents. This player is highly skilled, but struggles to beat defenders off the dribble. Likely a shooting specialist, this player makes his points mainly by moving without the ball. I've been through the Can't Be Guarded program and thoroughly evaluated its content. This program will certainly help almost any player get better, assuming said player puts in the time and goes hard during the workouts. 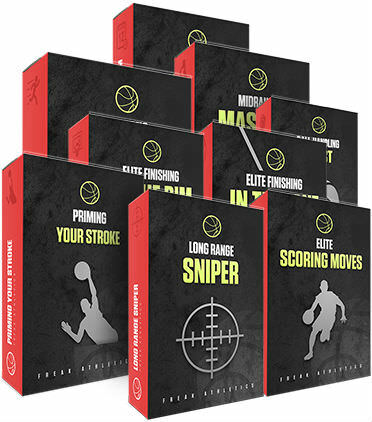 The drills included are quality and help you work on different scoring situations whether it be from the inside, mid-range, or 3-pointers. Can't Be Guarded will help beginning players who are naturally athletic the most. These players will benefit from learning off the dribble moves, which make up a big portion of the Can't Be Guarded drills. Advanced players who are not naturally athletic may not find the program as fruitful and may want to instead focus on functional strength training for basketball. Bottom line: this program will help all players, but not equally. A strength for Can't Be Guard is the program and workout structure, which is easy to follow and understand. However, the lack of instruction on how to complete each move correctly is a disappointment. Can't Be Guarded will help any player score more points. It is not a perfect program and hopefully they'll add more instructional content. If you're an athletic player at the beginning of your basketball journey you will get a lot out of this program and it will take your game to the next level.